That's right. #6 is here, after #5 went down the drain like #3 did before it. And rest assured, #6 will not be a hypo, as I seem to have regained by writing abilities, AND my interest in robot fanfic... thanks, new Robot Wars series'. Realies are allowed, and actually are a bit more encouraged now. Unfortunately, because the weight limit is 100kg, you cannot enter robots from the newest Robot Wars series unless they fall below 100kg, or match it within 1%. - Clusterbots are allowed, but they must be, at most, 4 bots weighing up to 100kg together. The weight bonuses apply for clusterbots too, but only if ALL the bots in the cluster have the same type of motivation, otherwise it's void. Also, all the clusters in the whole robot must be eliminated for the whole robot to be out. - You can only have a maximum of 3 active weapons going at the same time. 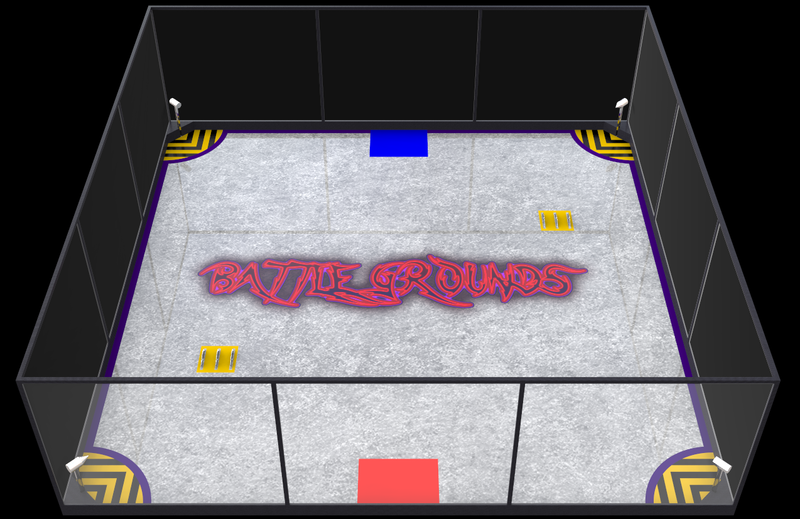 It's similar to the Battlebots arena, with two pairs of killsaws, and two hammers in opposing corners! However, do you see the spiked hammers, pictured? They are going to be replaced with house robots... specifically, Team Covenant's own house robots! Picture will be updated in due course. and so Nightmare would win the decision based on that. Or ones that are meant to be a joke. Because this isn't a joke tourney, k? If there's massive demand for stupid vapourbots, I'll re-open ATTTWI or something. NO VAPOURBOTEER FIGHTING. I don't know how many times this has occurred. If you have a beef with somebody, keep it off this thread. Remember, it's the robots that are supposed to be killing each other, not us. If I make a mistake during a battle, or with the line-ups, please kindly point it out to me so that I may rectify it. Like I said, I'm not perfect and often screw up. However, if you're an arse with your statement, consider it ignored. - grand final is 3 1v1 matches, then a losers' melee to determine the semis. Then single elim until we get our champion. There will be a 3rd-place playoff. If you have any questions regarding the tournament, please feel free to message me on Discord, Facebook, or heck, just post in the thread. Just a note, this will now be primarily hosted on the Advanced Robot Combat forums due to personal reasons. If you're a newcomer, please sign up on the forums and join in! Ta muchly! Last edited by kodster; 20th September 2017 at 17:28.
bUT WHAT IF YOU GOT AN ACCOUNT?? BUT IT DO NOT WORK?? ?